Many of you who stick around in the Rose and Crown after a ride will be friends with Doug (other half to Tea Ride regular Daphne). Not everyone who knows Doug though will be aware of his cycling history. 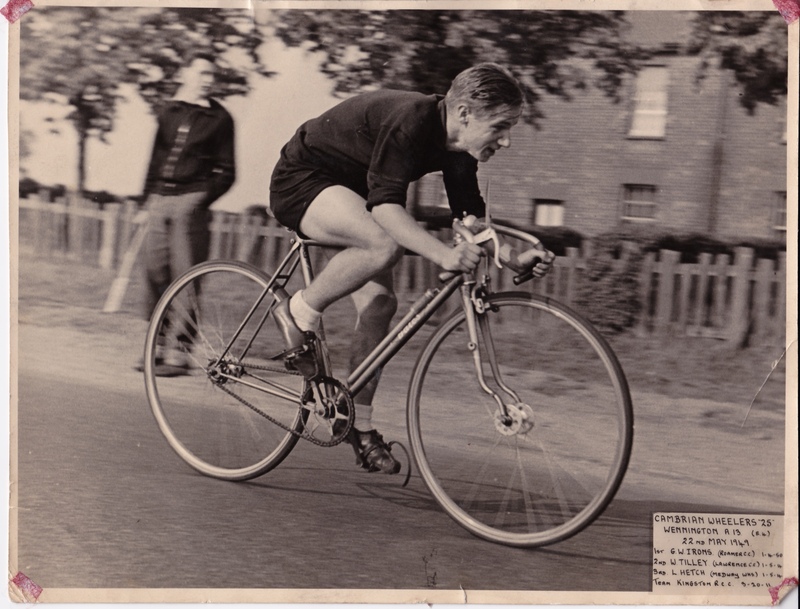 We thought we would share with you this week a photo of him riding the Cambrian Wheelers ’25’ in May 1949 – he was just 18 years old and, as you can see, had thighs to die for. Doug, we are in awe of you – this picture is simply fantastic. Thanks for sharing. Three rides on offer this week: an early start; something more the normal and a really flat route for those allergic to mountains. As always, please bring a copy of the ride. The Tuesday evening rides are that popular it seems that we don’t even have to mention them and people turn up all the same! So we won’t mention that we will be departing from the Pitstone Roundabout at 6:30pm Tuesday for another mid-week blast followed by rehydration at the Rose and Crown. Meet at the Rose & Crown for tea, cake and adventures. those that want to get some miles in. 10am rides. It looks dry but fairly cold tomorrow with a 10mph wind from the NE. All welcome to join us for Daphne’s birthday tea ride. Starting at the Rose and Crown at 10, we are off around the lanes aiming to arrive at The Stag at Mentmore by around 11 am for birthday tea and cakes. Delicious. See you tomorrow. We have three rides on offer for Sunday including another early start for those that want to get some miles in. These rides start at the Rose and Crown and we do ask that you bring a copy of your chosen route please. We are starting up our regular evening road rides again. Beginning with this Tuesday at 6:30pm there will be a couple of groups going out, one of which will be led by Dave Bembridge. He promises a flat ride for an hour or so at a leisurely pace. We meet at the Pitstone roundabout (the one near the village hall) and due to the impending dusk we tend to depart at 6:30pm sharp. Please bring lights if you plan to socialise at the R&C afterwards. Meet at the Rose and Crown for a gentle ride out for tea and back again. Be there at 10 am, tyres pumped up and chain lubed. Don’t forget some cake money. Please note the two different start times. We launch from the Rose & Crown and we advise you to bring a copy of the route you plan to ride please. Final call for getting your orders in for team kit. This run will close for orders on Monday April 6th. See below for how to order your kit. We have plenty of orders in already. Once registered, you should be presented with a “My Account” page that lists our “Ivinghoe Velos Store” and an “Order Now” link. You can then choose and pay for the kit items you would like to order. Once manufactured, all of the clothing will be sent as one delivery to me (Sally) and I will arrange distribution. This should be around the end of May. Go to the top left hand drop down menu ‘Cycling collection’. The basic shirt is the CS TECH Short Sleeve Jersey priced £37, but be aware that VAT and postage are not included. You will be able to see the full price of your order before you pay. The sizing samples have been left behind at the Rose and Crown bar so will be available for the whole of Sunday to try kit on. I wonders where the cyclists is. No, not at all – why don’t you come and see! Tomorrow’s adventures see us leaving the Rose and Crown, Ivinghoe at 10am for a circular ride, arriving at CuriosiTea around 11.15/30, where the prize for the best Easter Bonnet / Bike will be awarded. The Tea Ride. Every Saturday at 10am. Maintaining the essentials and standards of social cycling.